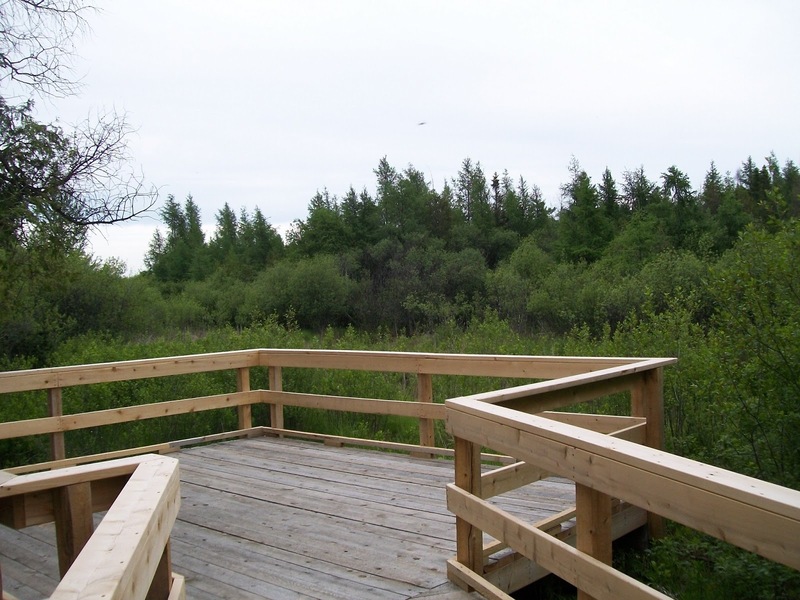 Located in the South Ottawa suburb of Findley Creek is the new Leitrim Wetland Boardwalk. Part of the South Nation Watershed, this provincially significant wetland is home to many unique plants and animals. The trailhead is located off Findley Creek Drive near the intersection of White Alder Avenue (N45 18.835 - W075 36.502). Though unmarked, it is not hard to find as it is visible from the street. The boardwalk is great for every member of the family, including the pooch. 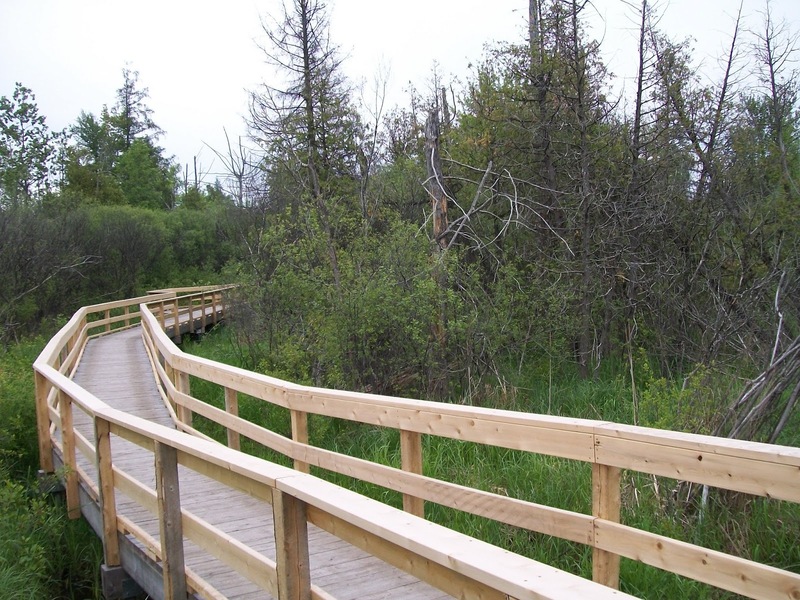 Along the trail, you'll be introduced to white pines, cedar swamps, tamarack and spongy marsh land. The boardwalk ends at a small platform overlooking the regionally distinct calcareous fen. Make sure you keep your eyes open for wildlife. Creatures that call the wetland home include Deer, Moose, Snapping Turtles and the Great Blue Heron. For more information on the Leitrim Wetland you can visit the South Nation Conservation website (click here) or you can check out the information plaque located about 500 metres to the east along Findley Creek Drive. The boots are knotted, the pack is full and the dog is excited... Today's hike is the Huron Trail located in Gatineau Park. Parking can be found at the Lac Fortune Lookoff (N45 30.707 - W075 52.099) which is just east of the trail head. The beginning is easy found as it is marked with a signpost (N45 30.727 - W075 52.269). This 4.9 km hike is marked for its entire length as trail 3 and ends with a fantastic view of the Ottawa Valley. The first leg consists of a steady climb for approximately half a kilometre. After that, the route levels out and is quite easy with only a few more ups and downs. The trail is for the most part is crushed gravel but also includes grass and mud. In the spring it's advised you wear Gore-Tex boots. For this hike, I recommend you bring at least two litres of water, a camera, a good trekking pole and a bear bell. You're walking into the back country, it's always a good idea to be prepared for anything. As you progress in the hike you'll pass a number of beaver ponds and even get a nice close-up of a dam. For those photographers, there are a lot of opportunities for scenery shots. This is also one of the trails that does not allow mountain bikers so there is no need to be constantly looking over your shoulder. 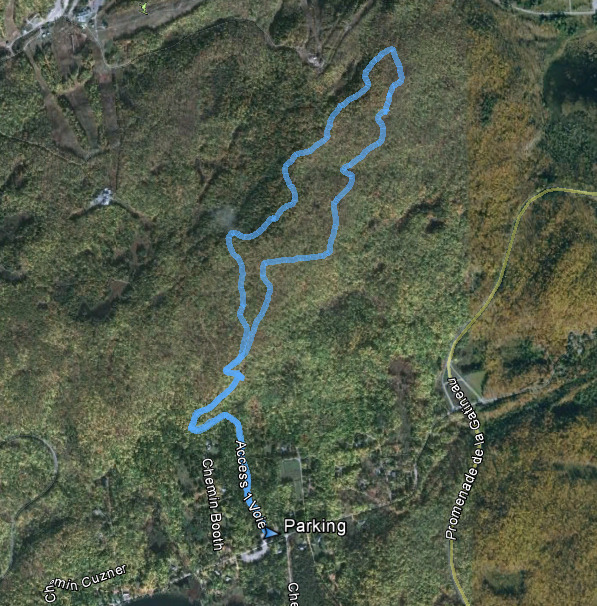 As you near the end of the hike you'll intersect with Trail 1, Ridge Road. Continue straight through for another 300 metres to the end of the trail and the Étienne Brûlé Lookout where you can enjoy a nice picnic with a great view. If you planned ahead and parked a second car at the Lookout then you're quickly on your way. If you have to hike back you have two options, returning back on the Huron Trail or heading south on Trail 1 which is an shorter and easier route back to the Lac Fortune lot. 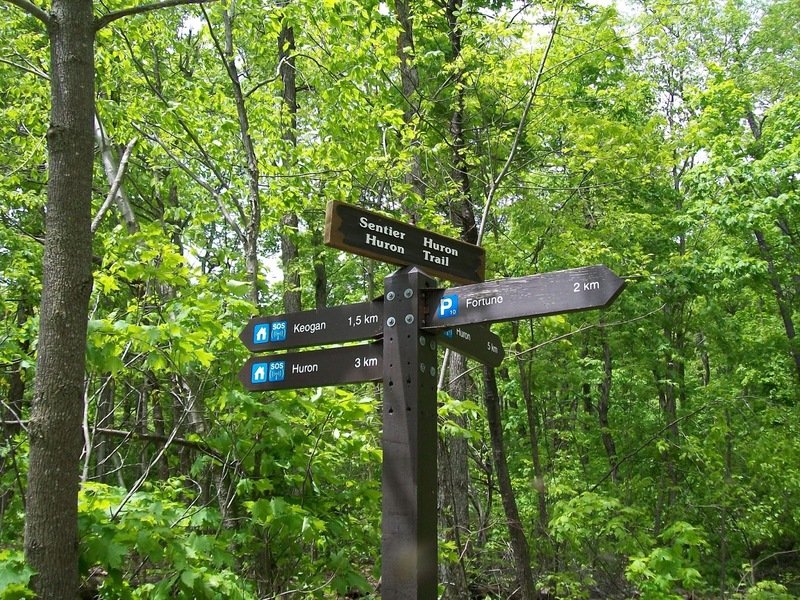 Huron Trail may be one of Gatineau Park's less traveled trails it is all worth it in the end. 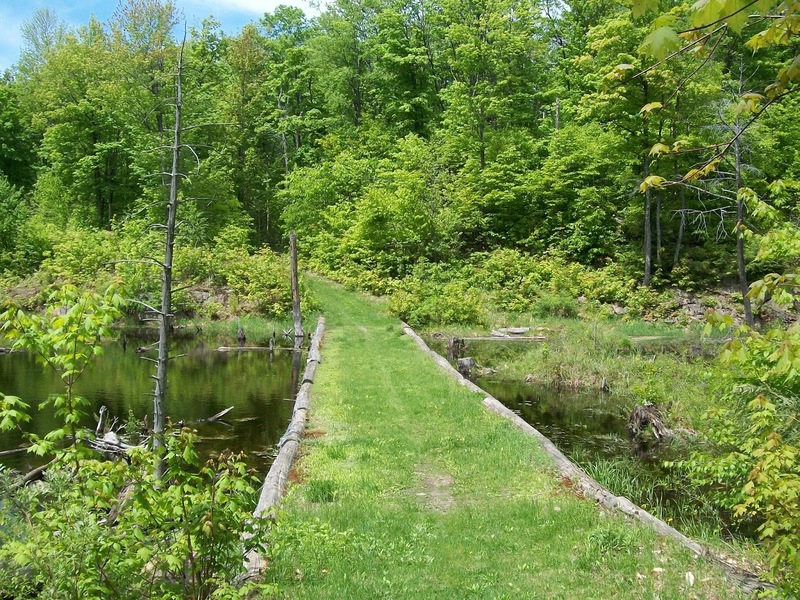 Located on the north shore of Upper Rideau Lake is Foley Mountain Conservation Area. With over nine kilometers of hiking trails and scenic views, the park has something for everyone. The entrance to Foley Mountain is off Country Road 10 just north of the Village of Westport and there is a $6.00 entry fee (per vehicle) which is payable by cash or credit. A must see is the Spy Rock Lookout which is located near the first parking area (N 44 41.068 W 076 23.527). From the clifftop you get a full 180° view of the lake and Westport. This parking area is also a great spot to start your hike as you have access to three different trails. To the north you can take the 1.3 km (loop) Beaver Trail which follows the shoreline of an old Beaver Pond. 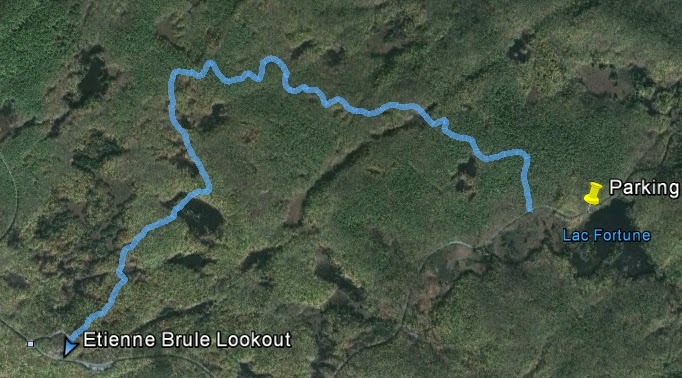 To the east is the 3 km Blue Circle Trail which takes you though wetlands and hardwood forests. To the south is the 1.8 km White Pine Trail which takes you along the ridge line above Upper Rideau Lake towards the Interpretive Centre. This section is also part of Rideau Trail system which runs from Ottawa to Kingston. For the most part, this trail is quite easy and mostly downhill. There are a few soggy spots and in the Spring there could be streams crossing the trail. If you're at the point where you need a break why not stop by the Interpretive Centre and learn about the park. Also located here is a second parking are (closed in the off season), washrooms and the wheelchair friendly, Mobility Trail. This short walk has views of the lake as well as information panels on how the region was formed. Each trail is marked with their own unique identifier and maps can be found near both parking lots or with the scan of a smartphone (look for the QR code). Whether you're looking for a easy walk or a tough hike, Foley Mountain will not disappoint. Located in the small community of Russell, Ontario is the W.E. Burton Conservation Area. This park on the Castor River has a picnic area as well as three kilometres of hiking trails. Parking is located off Church Street at N45 15.547 W075 20.860. The Castor River is part of the South Nation Watershed which also home to the Russell Dam and Reservoir. As you follow the trail there are several spots where you can enjoy a nice view river and dam. Not far from the dam is a open field which houses a covered picnic area. If you're with the family, this is a great spot to take a quick break and enjoy a snack. The river around the dam is fenced in so there are no worries about the little ones getting too close to the water. The W.E. Conservation area is a great spot to take the family or dog for an afternoon hike. With the exception of a few roots, the trail is wheelchair friendly and an enjoyable trek for all. 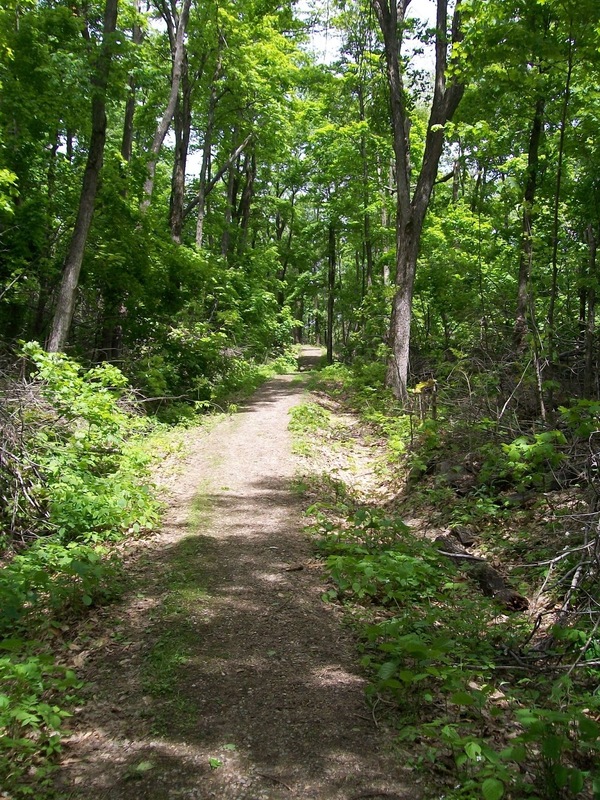 Located in Orleans, Ontario on the city owned Petrie Islands is the one kilometre Basswood Trail. There are two options for parking on this short hike... one free, one paid. The free parking is located just north off the cause-way near the Petrie Island sign while the paid parking is found at the end of the road towards the beach ($2.00 for five hours). As always, I managed to get free parking so that is where I am starting the hike. The trail head is located at the south end of the lot near the canoe launch. The terrain is quite easy and could be wheelchair friendly with a little help. The biggest obstacle are the roots from the large birch and alders that line the path. As you make you way along the trail you'll get some great views of the Ottawa River. During the warmer months these shores are lined with fishers looking to catch their next great story. It's also a great spot to take in the the fall colours that the National Capital Region has to offer. For birders, Petrie Island is a home to many wetlands, forests and meadows that are home to over 100 different species of birds. If you have binoculars, there are a lot of opportunities to use them. At the 700 metre mark of the hike you'll be approaching the paid parking spots. 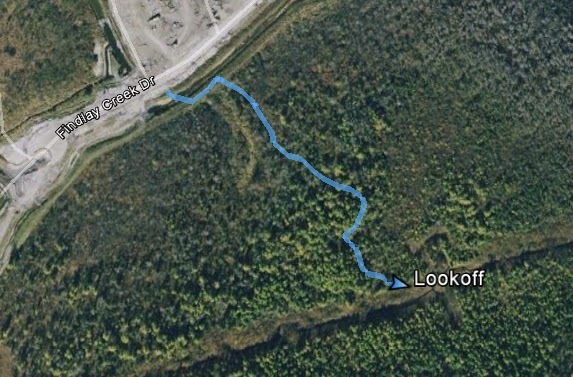 From here, the trail heads away from the water and into a flood plain forest and back towards the free parking. Basswood Trail is the perfect spot for a quick lunch hour walk or an evening dog trot with lots of spots for the pooch to take a quick dip. In the summer months it's also home to one of Ottawa's busiest public beaches so why not spend the afternoon and enjoy a swim yourself. 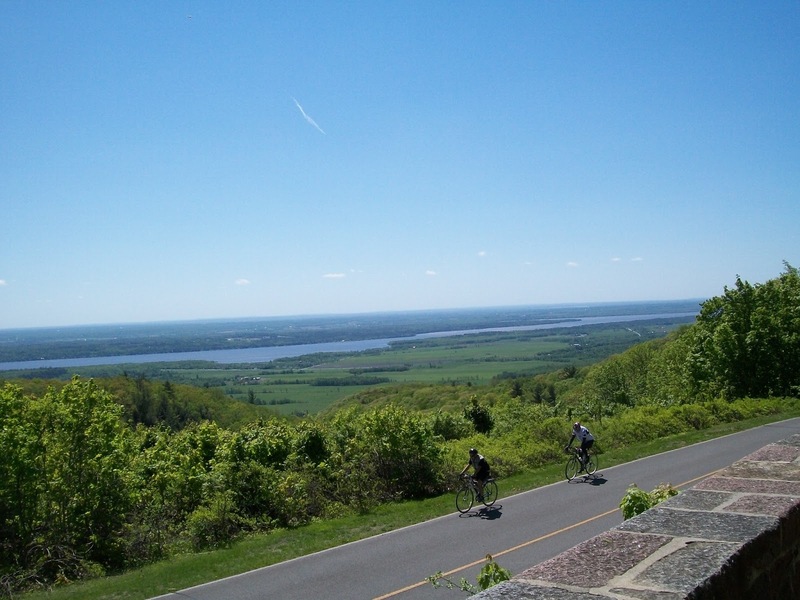 Located in the small village of Kingsmere in Gatineau Park is the Skyline Trail. This 5.7 loop takes you along the southern and eastern ridges of the Gatineau Hills and provide some great views of the National Capital Region. Parking is located at P7 (N45 29.454 W075 50.524) off Kingsmere Road. Before you can get to the actual Skyline Trail (Trailmarker 6) you'll need to follow approximately 1 km of the Trans-Canada Trail. From the parking lot head north along Trail 30 until you reach Trail 1 on your right. From here, hike up the steady slope until you reach your first scenic view, Wattsford's Lookout. There is a great bench where you can take a few moments to catch your breath and enjoy the view. Once you're ready to hit the trail again go back out to the main path and follow Trail 1 to the left. After about 100 metres you will see the well-marked entrance to the Skyline Trail. From here the trail turns from a wide, easy path the a narrow, rocky path. There are spots where you will need to watch your footing but it is not too difficult. At around the 100 metre mark of the trail there is a split, take the right path as this is the quicker route to the lookoffs. The hardwood forest provides some great scenery, especially in the autumn months. Gatineau Park in general is very well knows for their beautiful fall colours. After 1.4 km on the Skyline Trail the trees on the right will open into more great views of the region. At around the 1.6 km mark you'll reach the actual Skyline Lookout where you're at an elevation of 350 metres above sea level. From here you get a great view of downtown. As you continue along the path it will start veering to the left towards another lookout which has views of the east. At this point of the hike you are located near the top of the Camp Fortune Ski Hill, one of the top resorts in the region. When the trail was initially made it was a short cut for residents of Kingsmere to get to the ski hill. As you make your way along the path you'll eventually find the Trans-Canada Trail near the Wattsford's Lookout. From here, follow the same route back to P7. Skyline Trail is a great spot for those looking for tough hike with tons of scenic views. Even though it is has some rough terrain it can still be enjoyed by people of all ages as well as dogs. Located in the Oak Ridges Moraine north of Bowmanville, Ontario is Enniskillen Conservation Area. This 65 hectare park is part of the Bowmanville Creek watershed and home to many kinds of forests, wetlands and wildlife. This area was once home to a grist mill which stood from 1874 until 1956 when it was dismantled. Still visible is the earthen dam which is located north of the Education Centre. The main track through the park is the Moorey's Mill Trail. Parking (N 44 00.135 W 078 46.557) for this 2.8 km route is located at the Education Centre, the path starts at the north end of the lot. The trail is very well marked for the entire length with easy to read signage. From the start of the hike you'll head in a northerly direction where you will make your first crossing of the creek. This part of the hike will bring you through a mostly softwood forest before it opens up into grassy meadow and a sheltered picnic area. From there you'll make your way past the northern parking lot where you head back into the woods to the east. This part of the of the trail follows along the edge of the creek, crossing it at several points. Between the bubbling brook and the mixed forest, there is a lot to enjoy. This was by far the most scenic part of the hike. As you follow the path and cross a larger bridge you'll enter another picnic area. From here, the trail follows the side of a road back to the Education Centre where you began. Enniskillen is a perfect spot to take the family, as well as the dog, for a weekend walk. The park is open year round and a great choice to view fall colours, cross country ski or mountain bike. Enjoy.